The All Assam Students’ Union (AASU) staged protest against the steep hike in fuel prices across Assam on Wednesday. 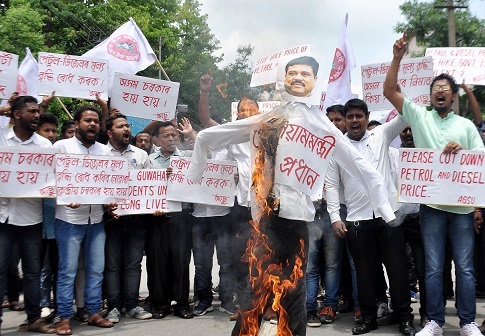 The All Guwahati Students’ Union (AGSU) activists burned effigy of Union Petroleum Minister Dharmendra Pradhan at Ujan Bazar in the city as part of the protest. The protesters shouted slogans like ‘Petroleum Minister Hai-Hai’, ‘Modi Government Go Back’, etc. The AASU condemned the BJP-led Central government for not being able to control hike in prices of petroleum and diesel along with other essential commodities. 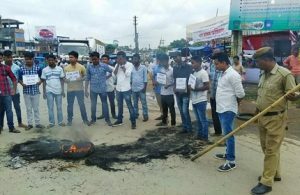 In Sivsagar district, the Demow unit of the AASU also burned effigy of Union Petroleum Minister Pradhan as part of the statewide protest against fuel price hike. President of AASU’s Demow unit Depankar Pratim Chatia, advisor Aditya Sarma and general secretary in-charge Sudipta Gogoi were present in the protest programme. In Biswanath district, Biswanath Chariali unit and Pavoi unit of the AASU also jointly protested against the hike in fuel prices at Biswanath Chariali. The activists also burned effigy of the Union Petroleum Minister. AASU’s assistant general secretary Duldul Borkotoky, Sonitpur district AASU assistant general secretary Ajmat Shaikh, Biswanath Sub-division AASU vice-president Rupam Das and Biswanath Chariali AASU unit’s Bikram Bikash Bora along with other leaders were present in the protest programme. Moreover, Biswanath district All Bodo Students’ Union (ABSU) general secretary Sangal Gayari, All Assam Karbi Students’ Union advisor Mangal Be and general secretary Jayanti Engti were also present in the protest programme. On Tuesday, the Assam Pradesh Congress Committee (APCC) also staged protest against the fuel price hike in Guwahati.